Missing from the picture is his well-deserved Poche Canadienne Royale De Légionnaire De Moustache Fob, roughly translated, the Royal Canadian Mustache Legionnaire Pocket Fob. I believe it is hidden in his left hand, as he worries at it constantly thinking on the horrors of war and the good men he lost. how do you suppose his moustache was injured? maybe he got an ingrown hair. those are the WORST. It was most likely accidentally shaved while brandishing his officer's saber against some bare-lipped roughian. Where could one find photos of moustaches of Spain? I'm fairly sure this is John Campbell, 9th Duke of Argyll, Marquis of Lorne. 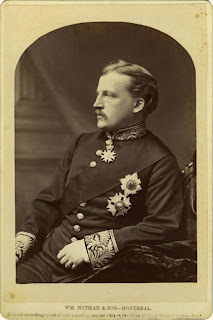 He was married to Princess Louise Alberta, daughter of Queen Victoria - and after who he named the Province of Albert.